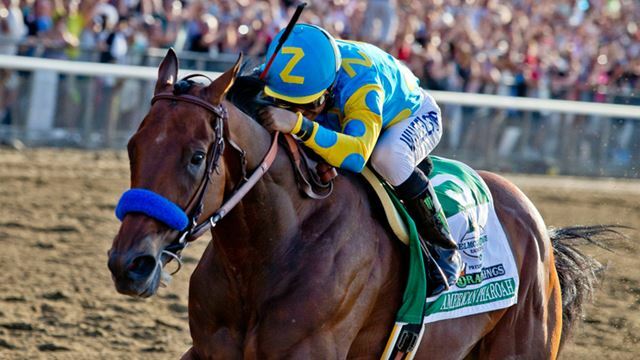 Is there anyone on earth–with the possible exception of the owners, trainers and jockeys of the other five horses in the race–who wasn’t pulling for American Pharoah to win the Belmont Stakes last weekend? From the second he shot out of the gate and jockey extraordinaire Victor Espinoza moved him to the rail and into the lead, I jumped up and down and whooped and hollered so loud and so long you’d have thought I had a million dollars riding on the outcome. When he crossed the finish line first, I cried. From what I’ve heard other people say in the days since the race, my reaction was typical. And though I didn’t analyze why until I sat down to write this column, I think I’ve finally figured it out. Every year, somebody wins the World Series. Somebody wins the Super Bowl. Somebody wins the championship in basketball and hockey and soccer and countless other sports. But it’s been 37 years since a racehorse won the Triple Crown. That’s why it’s so thrilling when it finally happens. If you graph the wins, an interesting pattern emerges. The first ever Triple Crown victory came in 1919. The 1920s were a dry decade, but the 1930s saw three winners. The 1940s boasted four. Twenty-five years would pass before Secretariat took the honors in 1973, followed by Seattle Slew in 1977 and Affirmed in 1978. That was it for the twentieth century. Half a dozen horses got our hopes up during the present millennium, winning both the Kentucky Derby and the Preakness Stakes but faltering at Belmont. Can you name any of them? Big Brown was the only one I could retrieve from the cobwebs in my brain, but google helped me remember War Emblem, Funny Cide, Smarty Jones (how could I have forgotten that name? ), I’ll Have Another and California Chrome. The long drought between Triple Crown winners isn’t the only thing that makes the runs for the roses and the black-eyed susans and the white carnations so exciting. It’s the idea that these contests on which so much is riding (pun intended) are each decided in less than three minutes. When son James ran track in high school, I was always grateful that he competed in distance events. At least when I climbed to the top of the bleachers to watch him run, I had time to pull a piece of chewing gum out of my purse before his 1600 or 3200-meter race was over. Parents whose kids were sprinters or hurdlers couldn’t sneeze or they’d miss the whole darn thing. That’s how I always feel when I watch a horse race. So much time, so much money, so much preparation goes into a contest that’s over in no more time than it takes to brush your teeth. I guess that’s what makes people jump up and down and whoop and holler while the horses run. And burst into tears when, at long last, one of them wins the ultimate prize.